Cat Chat With Caren And Cody: Cats! 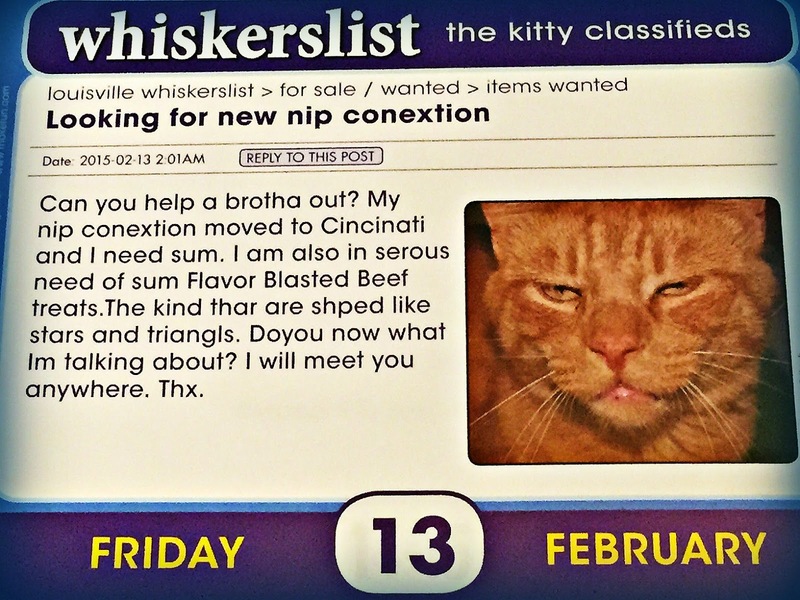 Enter our whiskerslist The Kitty Classifieds 2015 Boxed Calendar Give-Away! Cats! 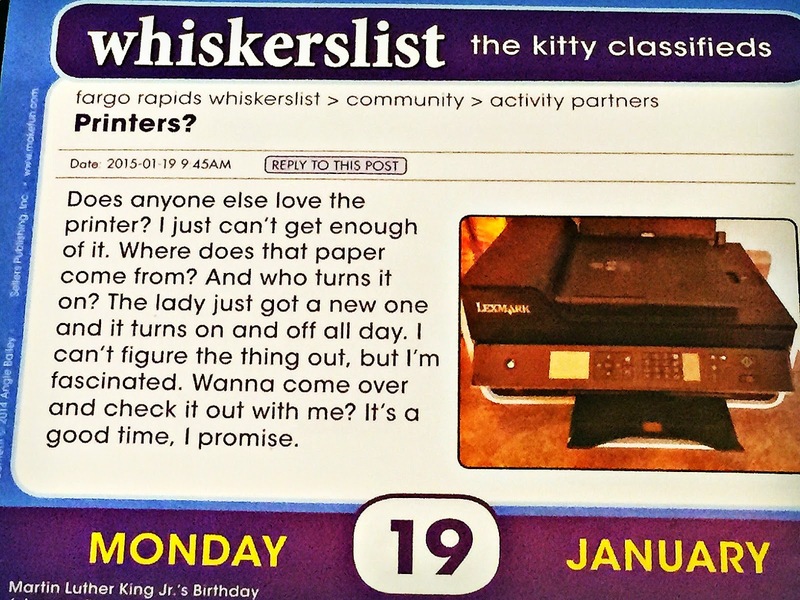 Enter our whiskerslist The Kitty Classifieds 2015 Boxed Calendar Give-Away! Hi my fluffy furiends, it's Cody pawing away on the keyboard today, and happy ALMOST December 1st! (Mom rushed me off of the computer and posted this on Sunday, when it really should have been posted Monday, but no worries, you can still enter! Guess Mom needs more than one calendar, eh? MOL!!) Did YOU remember to turn the page of your laugh-a-day desk calendar? No? You don't have one? Well, you will now! I am purrfectly proud to present to you the whiskerslist The Kitty Classifieds 2015 Boxed Calendar, created by Angie Bailey! CLICK HERE TO PURCHASE THE CALENDAR! 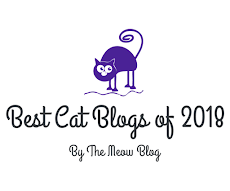 If you are a regular follower of my blog, you know that way back in November of 2013 I reviewed the hilarious book, whiskerslist The Kitty Classifieds by Angie Bailey, (there is also an accompanying website). 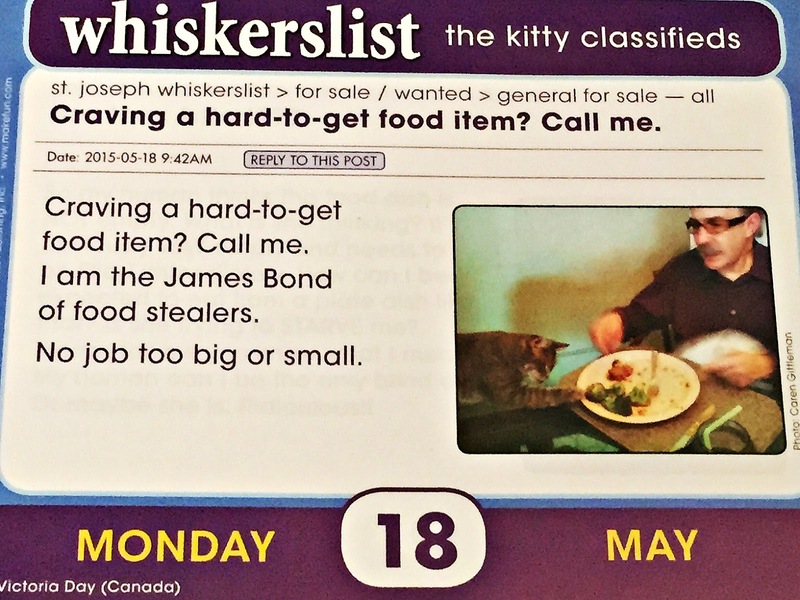 Now the wildly popular book, which is a highly amusing craigslist parody, has been made into a page-a-day calendar that fits purrfectly on a desk, kitchen counter, windowsill, table, ANYWHERE! If your humans are anything at all like my Mom, they have ALWAYS wondered what you do while they are not at home. Tell your humans to put away the Nanny Cam, they no longer need it! What we REALLY do when the humans are away is paw around the kitty classifieds online! What, your humans never noticed the pawprints on your keyboard? Your humans aren't the ONLY ones who surf the net! We kitties do too! 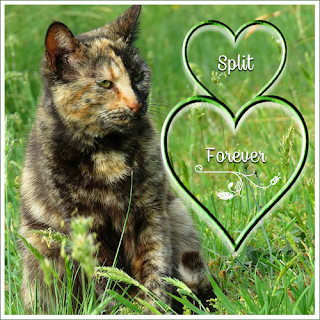 Classified ads are our faves, we can find EVERYTHING that our furry little hearts desire! 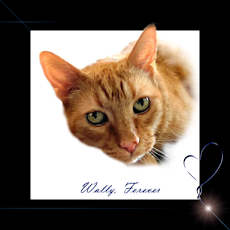 Kitties, tell your humans to check out some of the pages from the whiskerslist calendar to see what we are up to. Yeah, I know, our secrets have been revealed but it sure beats the Nanny Cam being on ya 24/7 ya get my drift? want to do their OWN meal prep! 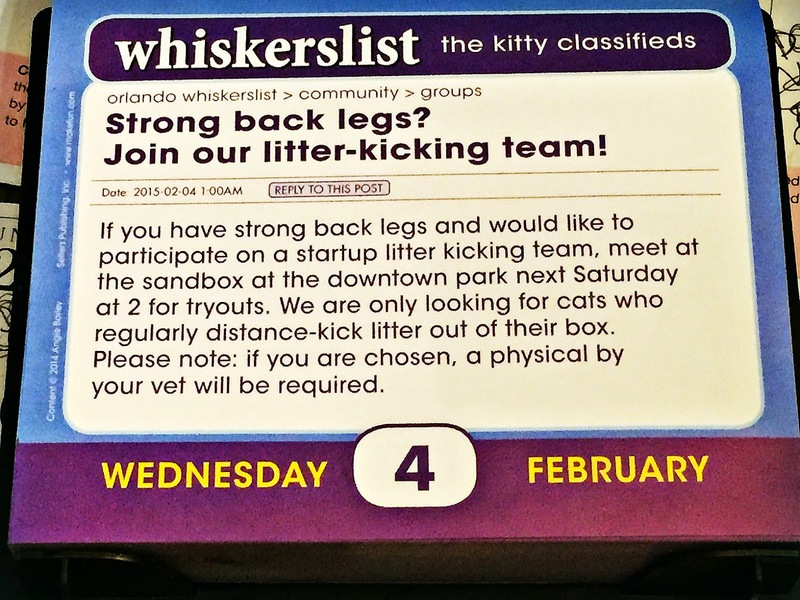 Love to kick your litter? Put that talent to good use! Beware though, there IS a catch! Be like this kitty and take your "jonesing"
to a WHOLE other level! I am in the calendar too! That's just a glimpse into this pawtastic calendar that will make your humans LOL every morning! If they are busy laughing, they might not even notice you counter surfing or taking extra NOMS out of the pantry. It's a "win-win' right? And even "LOL" Discussion Forums! Your humans will be DYING to have this calendar! 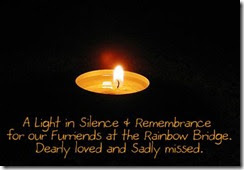 I know my Mom cannot WAIT for 2015 to come to an end. She has had a page-a-day calendar on her desk since as far back as the Stone Age when SHE took Classified Ads for Humans at her local newspaper! 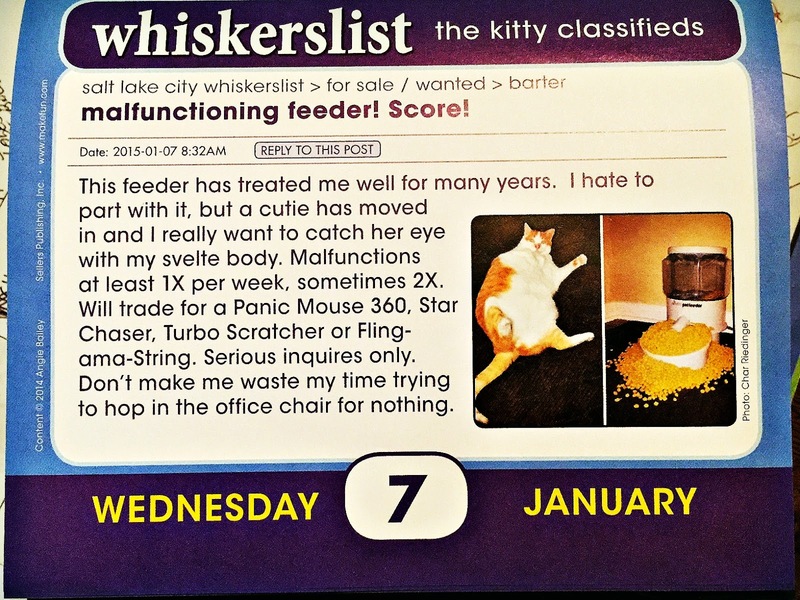 Mom purrticularly likes calendars that make her laugh, whiskerslist The Kitty Classifieds 2015 Boxed Calendar fits the bill purrfectly! So kitties, put away the mouse (no, not the toy one, but the one that you use for the computer sillies), go and knock over your human's purse or wallet, paw around and lift their credit card(s). With the holidays right around the corner, getting this calendar for your humans could quite possibly SCORE you more FOOD! (Maybe toys too, depending on how hard your humans laugh when they get their paws on the calendar). You are also in luck! Angie is offering one of my readers who resides in the U.S. the chance to win their own calendar! Just enter on the rafflecopter below, it's easy-peasy! (There is only ONE mandatory entry requirement). The calendar is an approximate $13.00 value! The give-away is open now and the winner will be announced on Wednesday, December 10th. Just in time for the holidays! Now, if you will excuse me, I have some kitty purrsonal ads to read online! In full disclosure: Mom was sent a whiskerslist The Kitty Classifieds 2015 Boxed calendar in exchange for her my honest review. Hey! I can't be bought, well, maybe, if there is food involved, KIDDING! All opinions are my own! I could hook that kitty up with some nip. Mom grows it in my backyard but I don't use it. The neighbor kitty (who I don't like) visits the plant, and maybe if I give it away that kitty won't come by as often. MOL! Did you enter? If you want to try and win a calendar be sure to enter on the rafflecopter! Thanks for the giveaway. Not sure it is working right but thanks for the opportunity. Hi Christy! It's working, I just tested it. There was one entry option that should NOT have been there but I removed it. The only task that MUST be completed is clicking on the rafflecopter and entering an email address. That's it! OMC! January 7th looks so much like Eric, right down to the tummy pose. Eric had a ginger chin, but apart from that it could have been him. you know what? I didn't notice til you said it and you are absolutely right! OMC OMC! That calendar looks like a lot of fun! Thanks for hosting the giveaway! you are most welcome and it is! We LOVE our copy of the whiskerslist calendar! Highly recommended. What a cool calendar! I'll enter the giveaway for sure! Those already gave us the giggles! That would be a fun thing to giggle away the sleepyheads here each morning! MOL!! 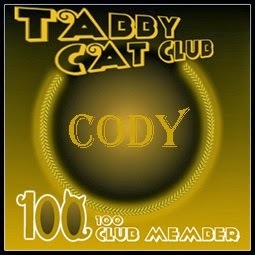 What funny entries those are and how proud am I that my buddy Cody is among them! Your food stealing ability is now PUBLIC knowledge so be prepared to get lots of texts and phone calls from kitties needing your assistance!!!!! We would love love LOVE to have one of these.......mostly because you're in it! MOL, those entries were too funny. And we love the fact your food stealing ability made the LIST. I'm in the book too!! 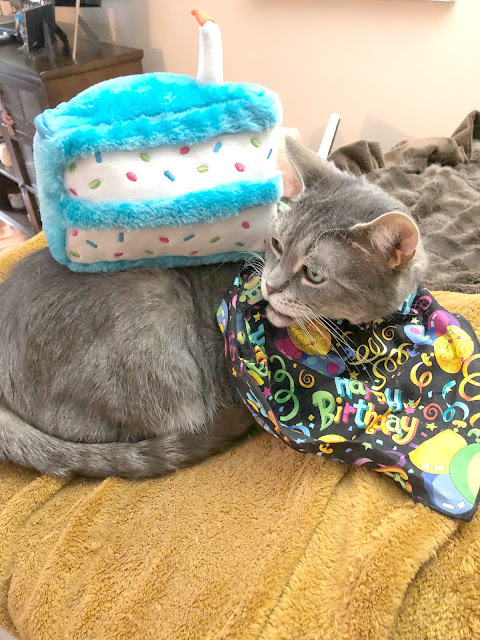 Thank you my furiend! I am in the book too! I would be purrfectly proud to display this lovely calendar on my desk—thanks for the opportunity to win it! That does look like a great calendar but we don't see the rafflecopter. We will be back to see if it comes up. Marg I sooo apologize! It appears that Rafflecopter is having issues....AGAIN. I emailed them and am waiting for this to be resolved. I am so sorry!!!! We would enter, but we just won one of these from Glogirly a few weeks ago. It is so cute!!! Meant to say, Cody, you really steal from your dad? Cool!! It's a must to start out the day with a LOL! This super neat calendar looks to fit the bill! We think Angie is just TOO FUNNY!! That is a great calendar- looks funny. Please visit us for a giveaway too. Pop could use a laugh at work. He doesn’t have room to put the new CB calendar in his space. That calendar is a riot!!! We already have one and can't wait to start using it! ... especially now that we know YOU are in it!! Loved the book and the calendar sounds just as fun. Thanks for the giveaway. LOL! Looks like a fun read that every catmoms and meowdads would enjoy this Catmass. Funny! This would brighten up my everyday. Loving this calendar. So original.